I thank Prof. Fathi Habashi of Laval University, Canada, for providing this review of the proceedings of the symposium on rare earths held during the Conference of Metallurgists. This Symposium provided a forum to discuss the critical issues generated since the mid-1980s when there was significant advancements in technology in the areas of renewable energy production, energy storage, hybrid vehicles, computers, smartphones, digital displays, or lasers all of which rely on materials made possible by the rare earth elements. 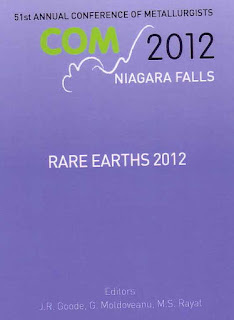 The book opens with an overview of the geology and economic significance of the rare earths sources plus two historical articles. It is interesting to note that while the rare earth metals were practically all discovered in Sweden, industrialization of these metals started in Austria. It so happened that a Swedish chemist went to the University of Heidelberg in Germany to analyze samples of rare earths minerals by the new method of spectral analysis invented by chemistry professor Robert Bunsen, most famous for the laboratory burner carrying his name. In the same period Carl Auer, a student from Austria, also went to Heidelberg to study chemistry. On his return to Vienna he carried with him the Swedish minerals for further study. It was there at the University of Vienna that he made his discovery of the gas mantel and the cigarette lighter and commercialised these products. 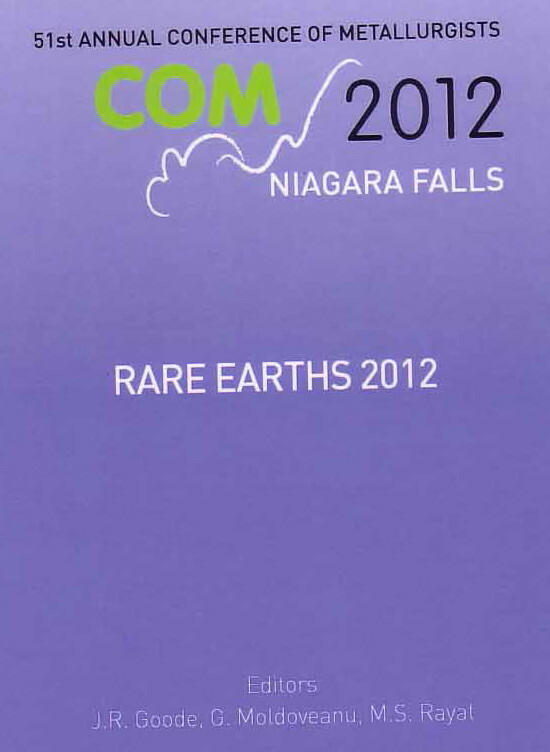 Rare Earths 2012 edited by J.R. Goode, G. Moldoveanu, ISBN: 978-1-926872-14-8, is published by Canadian Institute of Mining, Metallurgy and Petroleum. We invite your comments on the book. 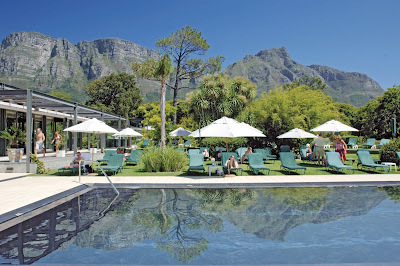 In less than two weeks time the first of three MEI Conferences commences in Cape Town, and I will be reporting on these events daily via the MEI blog and Twitter. 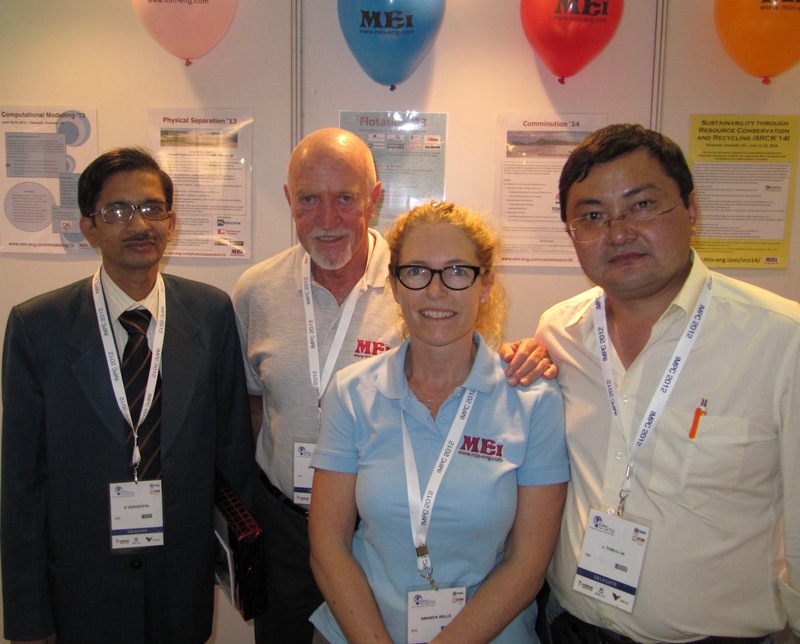 MEI’s main aim is to disseminate information, and to bring together minerals engineers globally, via our small but highly focussed MEI Conferences, and through social and professional networking sites on the internet. So this is an opportune time to remind you how you can keep in touch with all the latest minerals engineering news, and how to become truly involved with members of our industry around the world. MEI Online is the world’s largest source of minerals engineering information, both current and archival, on the internet. Unlike most information sites, there is completely free access, and if you have news of people, innovations, meetings etc which you would like to share, then please send your material and photos to amanda@min-eng.com, and if we feel that the news will be of general interest, we publish free of charge. If you are not already subscribed to the free fortnightly newsletter of updates, then just submit your email address in the box in the right-hand column of the homepage. As you are reading the blog, I assume that you know what it is all about. Since I started this in early 2009, readership has continued to grow, and visitors now number over 3000 per month. I get a lot of satisfaction from writing the postings, particularly when they involve news and photos of people, who are our industry’s major asset. I am also pleased that there is increasing interaction, and I really do appreciate your comments on the postings. If you would like to comment on any posting, and aren’t too sure of how to go about it, then just send your comment to me at bwills@min-eng.com, and I will add it for you. If you would like to be alerted to new blog postings, then submit your email address in the box in the right-hand column. MEI’s Minerals Engineers group on LinkedIn now has over 3300 members, and is growing at around 100 members per month. This is not as fast as many other minerals industry groups on LinkedIn, perhaps because we vet each applicant according to a simple criterion- will he or she be interested in, or be able to contribute to, the discussions in the group? The group is essentially MEI’s discussion forum, and is often linked to blog postings. There is no Jobs section (Jobs can be posted on MEI Online with no charge), and each discussion topic is carefully moderated before publication, to avoid spam and blatant company advertising (companies can list their products and services in the Business Directory of MEI Online). Announcements regarding meetings, publications etc can be submitted to the Promotions section of the group, or directly to MEI Online. It is not easy to convince many people that Twitter has any real value, and I was once very sceptical about it. But the good thing about Twitter is that there are no rules, and you use it as you feel fit. If you follow MEI on Twitter, you will receive the very latest news headlines from MEI Online, LinkedIn and other sources. If you do not have a Twitter account, then these tweets are fed into the right-hand column of the MEI Blog. I am not an avid user of Facebook, but Amanda is, and she has done a superb job with the MEI Conferences Facebook pages. What I particularly like is the collection of photo albums from all MEI Conferences, where you can add comments and tag your friends. To follow this, all you have to do is visit the pages, and press the ‘Like’ button. So do try to get involved with networking with minerals engineers via all the modern methods at our disposal. Since I became involved, life in the minerals industry, which was always good, has got even better! The latest comments can also be seen in the right hand column of the blog. If you would like to be alerted to postings, please submit your email address via the box in the right hand column. 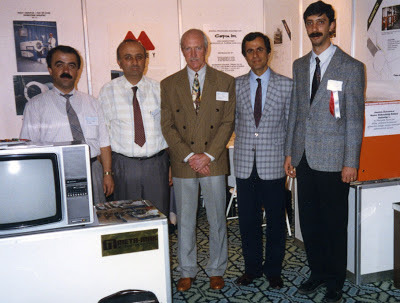 I thank Prof. Fathi Habashi, of Laval University, Canada, for this review of the proceedings of the symposium on pressure hydrometallurgy held at the Conference of Metallurgists. Autoclaves have been commercially used for the extraction of aluminum, nickel, cobalt, zinc, uranium and copper, for the oxidation of refractory gold feeds, and for the purification and recovery of various metals and metal by-products. New construction materials and improved reactor design extended the application of this technology. 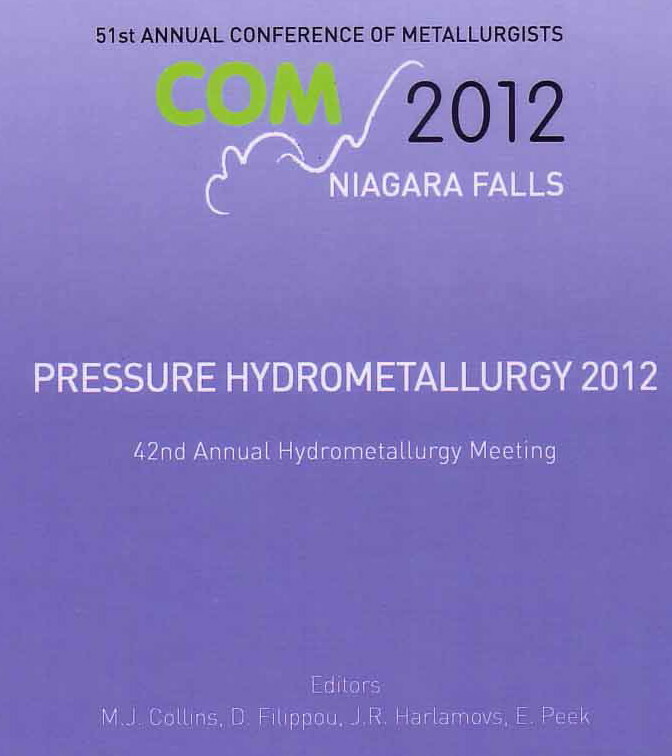 Pressure Hydrometallurgy ’12, edited by M.J. Collins, D. Filippou, J.R. Harlamovs, and E. Peek, ISBN: 978-1-926872-10-0, is published by Canadian Institute of Mining, Metallurgy and Petroleum. We invite your comments on this volume. 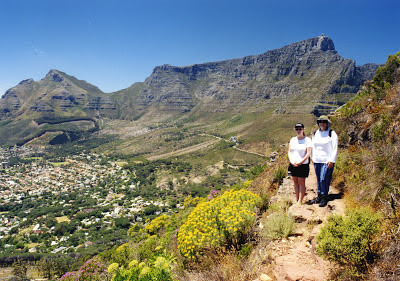 Lion’s Head- Cape Town’s most spectacular walk? Cape Town is a remarkably photogenic city, and no more so than on the spectacular walks along the coast and around and up the mountains. A hike up Table Mountain is always a rewarding experience, but it is gruelling, and this year an Achilles tendon injury rules this out for me for the first time in several years. Instead on the Saturday following Process Mineralogy ’12, we are hoping to walk up Lion’s Head, perhaps the best value for energy walk in the Cape. 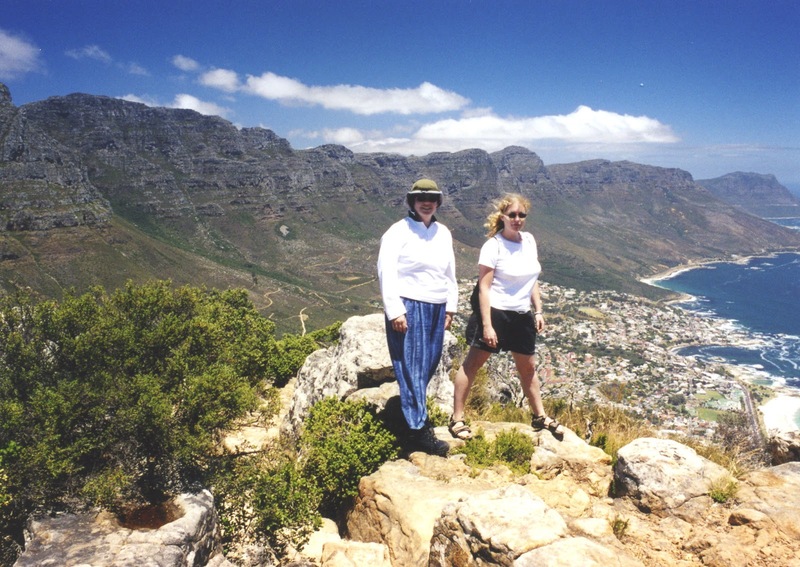 It is a surprisingly easy walk, considering the daunting view of Lion’s Head from the city, as the path gently spirals 360 degrees around the mountain, offering a kaleidoscope of views of the City Bowl, Table Mountain and the Cape Peninsula from Camp’s Bay onwards. If you are an inexperienced hiker, you may wish to walk only to the plateau, which affords a majestic view of Table Mountain. From the plateau it is a slightly exposed but not too difficult scramble up the granite cap to the summit. So if you would like to join us for this Saturday afternoon outing, we would like to hear from you. Twenty years ago today the 4th International Mineral Processing Symposium opened in Antalya, Turkey. 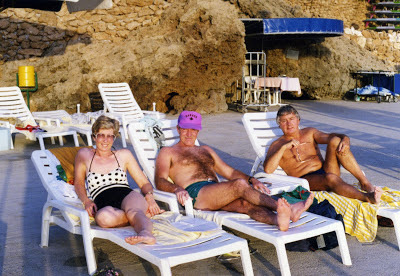 Below are a few photos which may bring back memories of that very enjoyable conference and its associated social events. 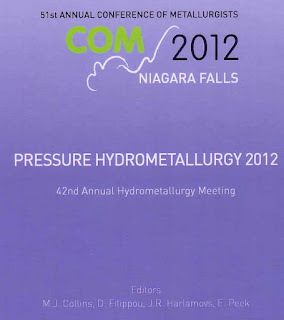 I was unable to attend this year’s Conference of Metallurgists at Niagara Falls, due to a very unfortunate clash with the IMPC in New Delhi. 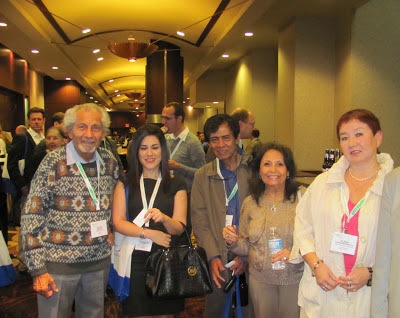 So I am grateful to Prof. Fathi Habashi of Laval University for sending this photo taken at the conference reception. “Enhancing Innovation and Technology Development Capabilities Through Collaboration” by Engin Özberk from Cameco Technology and Innovation. I invite comments from anyone who was present at the meeting. With well over 100 delegates already registered and nine major sponsors, this is one of MEI's 'majors', which is as it should be, as a good knowledge of process mineralogy, and the tools available for analysis, is now essential to all mineral processors dealing with increasingly complex and refractory ores. One of MEI’s smaller, but high calibre 2-day conferences, with around 50 delegates expected, the event is sponsored by major gold and platinum miners. 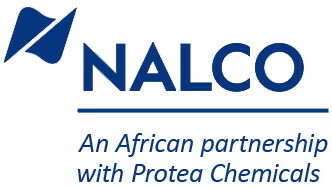 Another highly focused 2-day conference, sponsored by Nalco Africa, with around 45 delegates expected. Treatment of sulphide ores, by flotation, leaching and pyrometallurgy. We look forward to seeing you in Cape Town in a few weeks time. 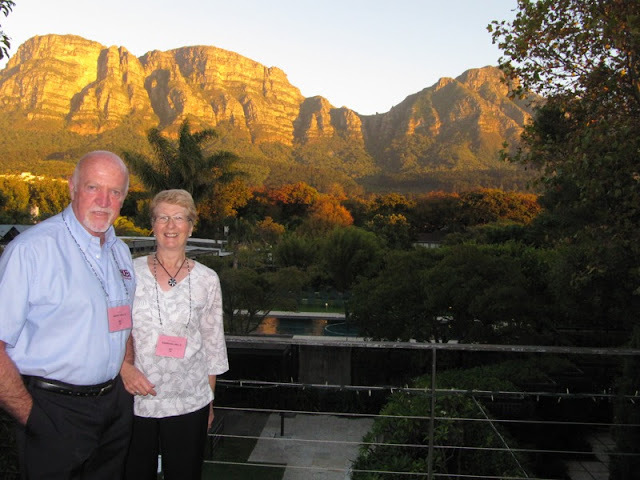 It is with great sadness that we report that Maurice (Maurie) Fuerstenau died on October 7th from a major stroke. 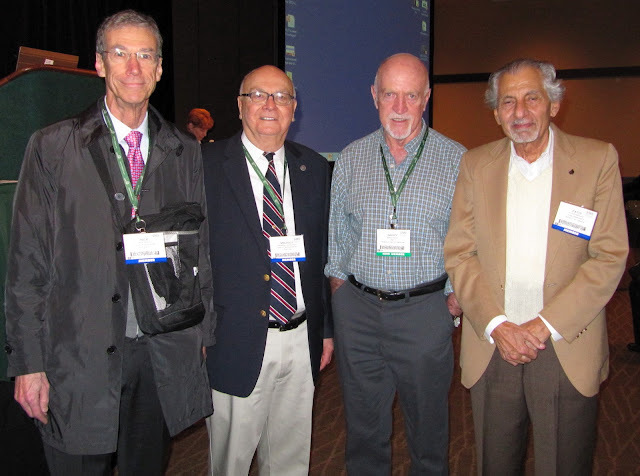 I met Maurie only this year, at the SME Meeting in Seattle, and found him to be a charming and modest man. On behalf of MEI, and all our many mineral processing colleagues, I extend my sincerest sympathy to all of Maurie’s family. He will be greatly missed and I am sure that there are many who will want to send their personal condolences to the whole Fuerstenau family. I therefore ask you to leave your memories of Maurie and your appreciations of his life in the comments section below. Precious Metals ’12 is only 5 weeks away, and the excellent technical programme is sure to promote much discussion. None more so than a quirky paper by Prof. Jannie van Deventer of the University of Melbourne, Australia. 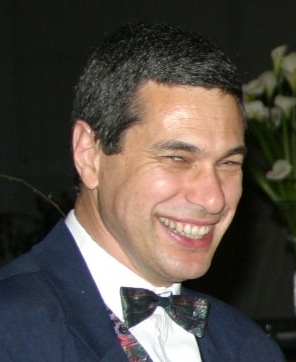 Prof. van Deventer asks “What would happen if precious metals have a distorted valence electron structure not yet studied by science?” Such species will not mimic the usual chemical reactions of normal precious metals, they may not even behave like metals, and they will not be detectable by spectroscopy. They will certainly not be studied, as no tenure track academic could afford such controversy. Prof. van Deventer will review some of the pseudo-science available on this subject, present his own observations, and conclude that there is sufficient evidence to stimulate further research. He freely admits that his arguments have not been subjected to peer review and without substantial research will not withstand a peer review process. Many of the ideas are so far-fetched that they are considered as lunacy and contravening the laws of nature by main stream metallurgists and scientists. Consequently, they are unlikely to be investigated with scientific rigour by the research community, and they will not attract funding by competitive grant agencies or companies. It is politically easier to outright reject them rather than risk one’s hard earned reputation to even suggest that they are worthy of research. There is little chance that the management of a major precious metals company or any university will investigate this field of non-assayable ores. What is required is a combination of strong fundamental research in fundamental aspects of physics and chemistry, coupled with applied research trying to reproduce some of the anomalous observations by non-main stream people who have been active in this field. Although the in-bred sceptical mind of the true scientist is always necessary, an open mind is a prerequisite for making progress in this field, otherwise prejudice will prevail over sensory observation. In today’s world of modern chemistry there is an attitude of ‘if we cannot measure something it does not exist.’ In contrast, in a past era of pre-spectroscopy chemistry, sensory observation by chemists played a key role in making progress and reporting findings to colleagues. In today’s culture of peer-review, unquantified and subjective sensory observations by a researcher are viewed as inferior and not true science. It is contended by Prof. van Deventer that progress in recovering precious metals from non-assayable ores is possible only when a scientist is able to forsake spectroscopy for sensory observation. The ultimate judge will be whether or not actual precious metal is recovered from a non-assayable ore. Looking back on last week’s IMPC confirms my belief that the Congresses are perhaps the most important events for mineral processors of all disciplines to get together and ‘network’. 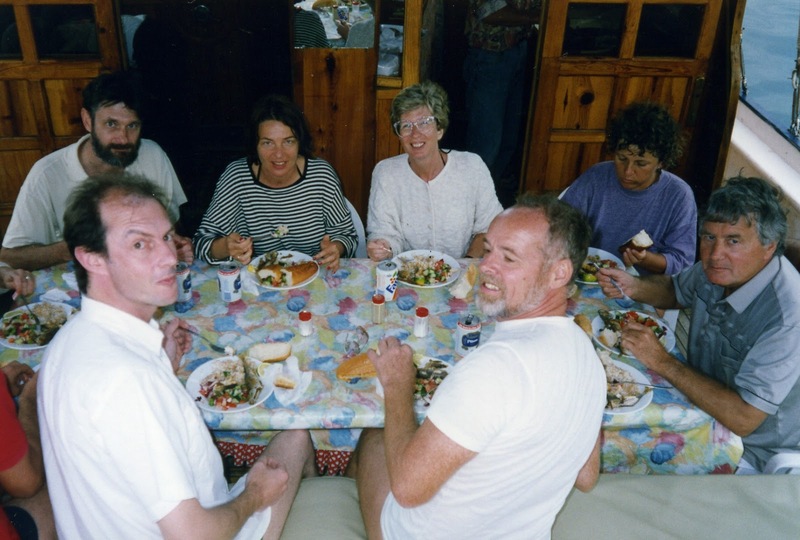 I caught up with many old friends last week, but was surprised that many people that I expected to be there were not, for various reasons. I am sure that after reading my report on the event, they will regret not having travelled to India. It was also great to meet many new people, particularly the next generation of minerals engineering students. 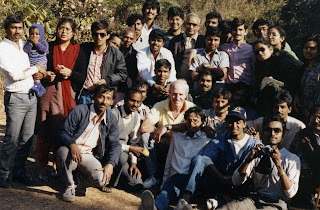 Many of these students were from the Indian School of Mines, which I visited 23 years ago. 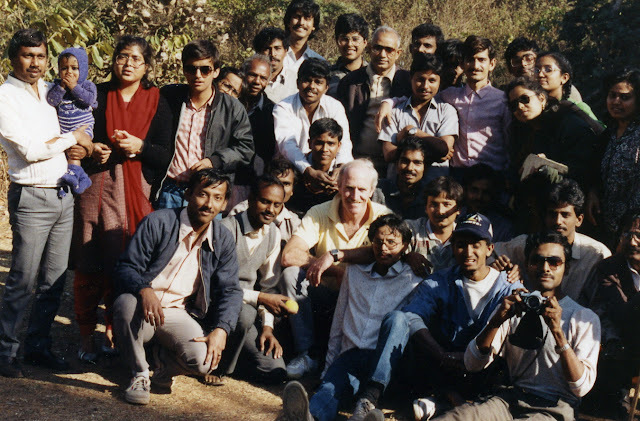 I was hoping to meet some of the students from 1989, who are on the photo (left), and also members of the staff at that time photo below). I did meet up with Prof. T.C. Rao (4th right above), then head of minerals engineering at ISM, and it was also good to meet Prof. R. Venugopal (2nd left above) who is now President of the Indian Institute of Minerals Engineers. Those that I did not manage to see, were you at the IMPC, what are you doing now, and where are you in the photos?